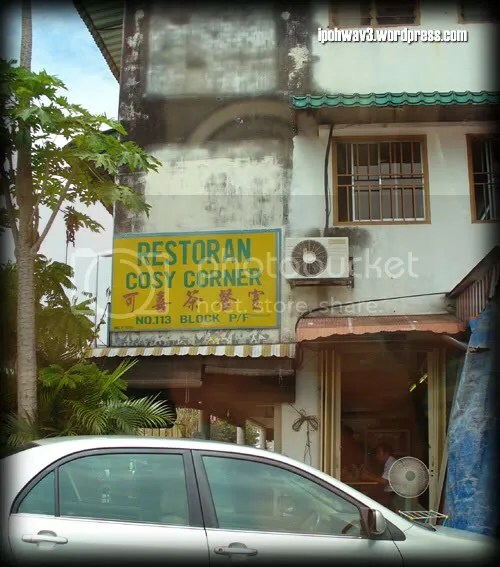 Restoran Cosy Corner @ Taman Cheras, Yulek | Ipoh Mali Talak Sombong! I went down to find her and off we go to a nearby place for lunch. She claimed that the Lam Mee here is nice. Tucked away at a little corner of the shoplots opposite the single storey linked houses at Taman Cheras, Yulek, the premise looked a bit worn down. But that didn’t deterred the crowd to come here for their noodles and yong tau foo. But to eat here, one have to prepared to be seated beside the drain and withstand the heat from the warm weather. Since boss raved so much about their Lam Mee, I decided to have the original one (RM4.00). Thick yellow noodle, beansprouts and chicken strips swimming in the dark, slightly eggy gravy (I gave all the shrimps to my boss :p ), I feel that their Lam Mee is above average. The good is the absence of the alkaline taste which sometimes come with the yellow noodle. The gravy is smooth and not too starchy. We also order few pieces of their home made yong tau foo such as stuffed okra (lady’s fingers), fish ball, squid ball and stuffed fu chok which costs RM0.80 per piece. The fu chok is good while the others are just normal. The okra is kinda tasteless. Boss went for the Meehoon Lam Mee (RM4.00). Sorry for the messy pic cos she dug into the noodle as soon as the noodle arrived on the table. 😛 Ah, I almost forgot that they have a very good home made chilli sauce to go with the noodles too. 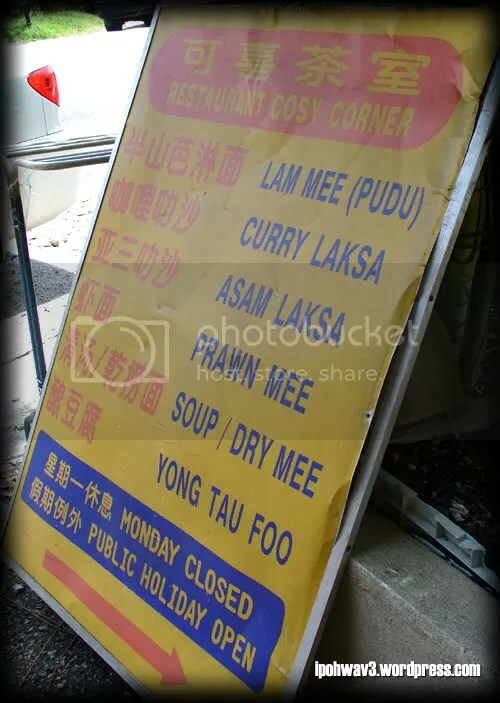 I heard that their prawn mee and curry laksa are not too bad, maybe shall drop by again to try them. Directions: Take the Cheras/Kajang route from Jalan Loke Yew, go straight till you come to Taman Midah (on your right) with Toyota Showroom and Old Town Kopitiam (on your left). You’ll see the Middle Ring Road 2 (MRR2) flyover. Instead of going on the flyover, turn left, down to the roundabout and take the 9 o’ clock direction. You’ll come to a traffic light, turn right and go straight up (pass BHP petrol station) till you see 7-Eleven. Go further up, into a narrower lane and you’ll see Cosy Corner on your right. 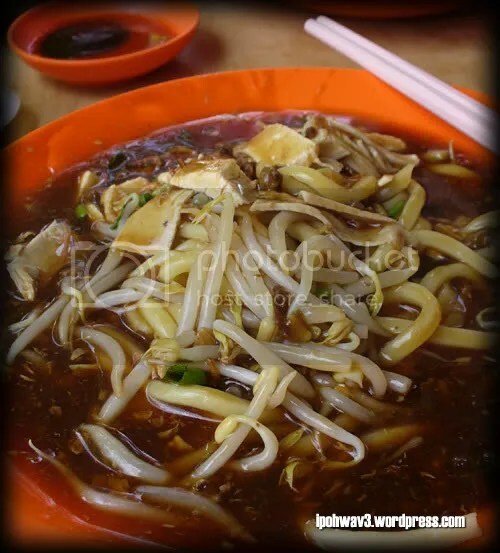 This entry was posted in Food (Cheras), Type: Chinese by Jason. Bookmark the permalink. hmmm. i found this place so-so only. the quality has decreased as compared to last time. no idea why. I have never tried Lam Mee before, is this the one where you put in some black vinegar? Ai Wei: That’s my first time there, I found it ok la, not too bad. But they have really good chilli sauce. Precious Pea: Em, no black vinegar. The noodle is supposed to be a bit sweet, not sour. The dark gravy is from the dark soy sauce i think. Another one who can snap food pix in front of boss. Salute! i love lam mee… is this as good as May King’s @ pudu? Tummythoz: My boss knew I have a food blog *grin*. Furthermore, we’re not in the office. err i have been living in this area for so long..didnt know this exist haha..
i had may king that day after all those donkey years..man it tasted good..i will give this a try 1 day..but i dunno if i can brave that longkang or not haha..
Eh, how come the lam mee looked like Penang’s lor mee instead? Excuse me, is this Penang Lor Mee or Lam Mee?? 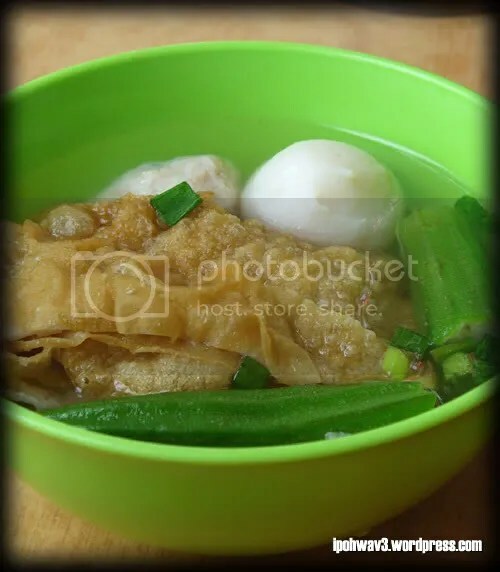 It doesnt’ look like Lam Mee leh… Lam Mee’s soup is more clear…. i’m hopeless in cheras…guess i’ll never get to try this place..
SC: Maybe you can try May King @ Pudu? Easier to find I guess. lotsa bean sprouts in your lam mee!!!! how come your lam mee doesn’t come with hard boiled egg? In KL, this is what we called as Lam Mee. 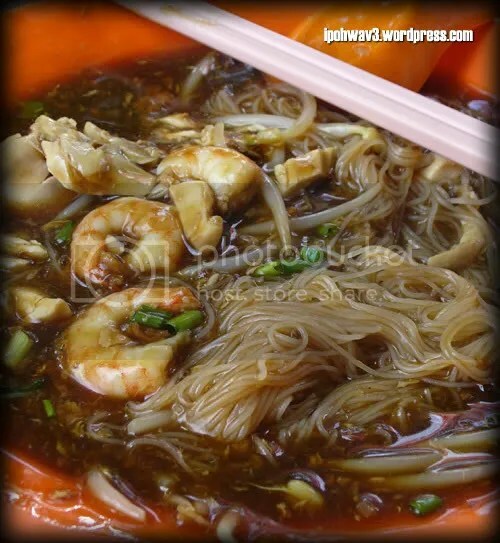 Lor Mee is those you find at Hokkien Mee stalls (or Tai Chow). Anyway, used to eat here pretty often on Sundays. But stopped years ago when the crowd got bigger and more options available else where. Must check out their meat balls, one of my fav! Looks excellent, something I must try! Mei Yen: Emm… I have no idea. Very seldom have Lam Mee, so I don’t know what it supposed to come with. Tankiasu: Thanks for the info! Meat balls… ok, noted down. BBO: Any nice Lam Mee in PJ? I know you have clarified but still I have to say that they looked like Penang’s Lor mee, probably the same dish with different names? vKeong: We think so too. Alam Damai? Sounds familiar… is it nearby Cheras too?